Quote Reply Topic: Cruel Trick?
. I sent my buddy this pic I took at home this morning. 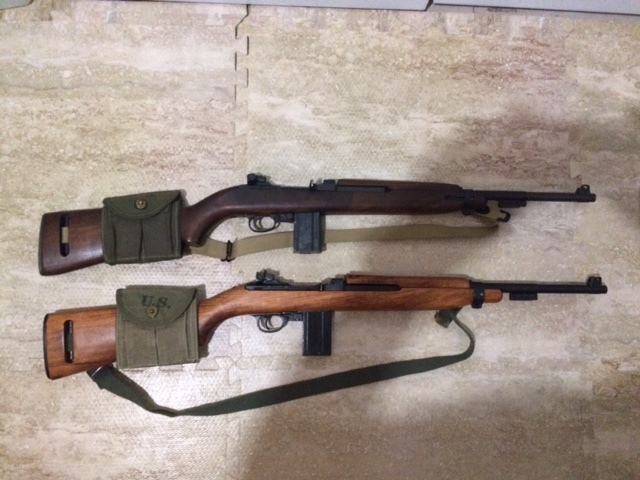 He is chomping at the bit to buy his first Carbine, and now he thinks I have two! One is a $165 Denix replica. He is bitterly jealous and and beside himself over this! I shall let him grumble a bit longer.... Lol! no tell him you will sell him one for only $200 and give him the Denix. He will be thrilled.............until he gets it. He keeps texting me. Gotta' put him out of his misery soon! Still stringing him along. Adding a genuine barrel band spring to continue the ruse. Funny as some states you can have a M1 carbine but the replica is banned!